Seville, a beautiful city in southern Spain, is famous for more than its barber. Ferdinand Magellan’s fleet started its round the world voyage from Seville in 1519. Seville’s archive of original writings documenting the story of fifteenth and sixteenth century Spanish explorers is a UNESCO World Heritage site. Seville’s cathedral, the second largest church in Europe, contains at least part of what was once Christopher Columbus. By the fifteenth century, Seville had become one of the most prosperous cities in Europe, profiting enormously from trade passing through its inland port. The cathedral was begun in 1401 to show Seville’s wealth to the entire Christian world. When completed more than 100 years later, the cathedral covered more than 100,000 square feet. A royal decree then required that all trade with the New World go through Seville, further increasing its wealth and prestige. When Christopher Columbus died in 1506, after his fourth voyage across the Atlantic, his body lay for a while in Seville before being transported to Santo Domingo in what is now the Dominican Republic. When Spain ceded Santo Domingo to France in 1795, remains said to be those of Columbus were sent to Cuba, where they stayed until after the Spanish American War. In 1902, the remains were shipped back across the Atlantic and placed in a tomb in Seville’s cathedral in front of a massive painting of St. Christopher, the patron saint of travelers. In 1877, workers in Santo Domingo found a box containing what they claimed, with some justification, were the bones of Christopher Columbus. 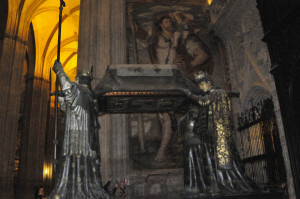 To resolve claims the Seville cathedral had the wrong body, scientists conducted DNA tests on the contents of the Seville tomb. The tests showed a close match with known Columbus descendants, but also revealed that the massive tomb contains less than 200 grams of what one guide describes as a “potpourri” of bone fragments. The Dominicans rejected these tests, but have not tested their bones. Columbus, who departed from Spain and landed near Santo Domingo on his first trip across the Atlantic, may appropriately now rest in both places.